Roy Chan, Director of the Oakland Chinatown Oral History Project speaks to OMCA Connect. 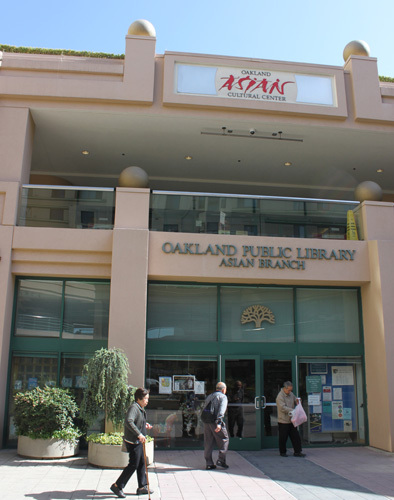 The Oakland Asian Branch Library is located in the Pacific Renaissance Center, ​a town center of Chinatown. It’s 10:15am on a typical weekday and the Asian Branch Library is packed. For many residents of Oakland’s Chinatown, it is a de facto living room: a place to read one of eight Asian-language newspapers in the morning, a place to use the Internet and find out about job opportunities, and a place to interact with neighbors. It is the busiest library branch in Oakland and a Chinatown landmark. This year, Chan and Oakland Chinatown Oral History Project aim to collect stories and memories from throughout the library’s 40-year history. Chan was one of the many people I talked to earlier this year at the Lunar New Year festival hosted by the Oakland Asian Cultural Center. 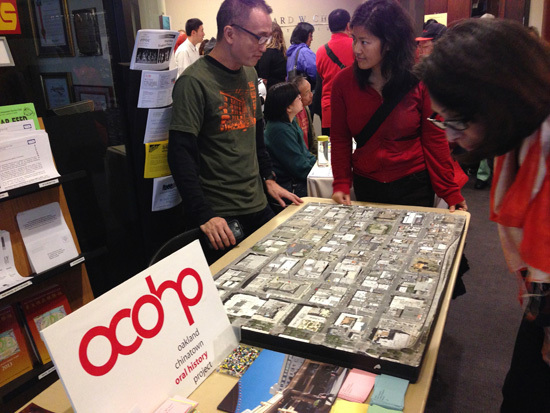 His table was distinctive: using a large satellite image of Chinatown, Chan created a 3D memory map inviting people in the community to write a memory of a particular place and pin it to a building. Since 2008, the map has accumulated over 200 pins, each placed on a building that you can pop up and put your memory inside. There are over twenty memories just of Lincoln School. 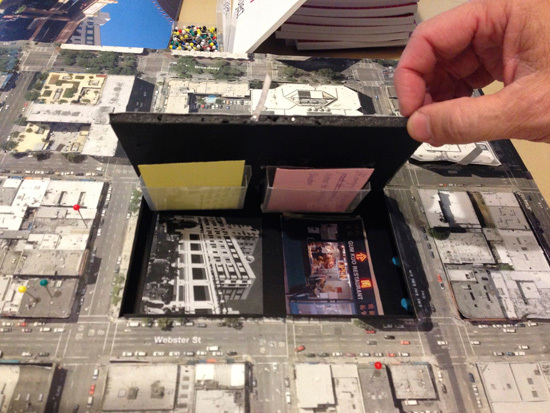 The memory map invites participants to deposit their stories inside of the map. Chan, a community historian, believes the map supports the idea that places hold deep meaning for people, especially in a cultural ethnic neighborhood like Chinatown where many immigrants plant roots and raise their families. “The idea is that we wanted the history of the neighborhood to come from the people that grew up here, that live here, that go to school here. Places in the neighborhood trigger memories for people, whether it’s Silver Dragon restaurant, the Asian Branch Library, or Lincoln School, or the Oakland Asian Cultural Center,” he said. For Chan, the Oakland Asian Branch library raises happy memories of childhood. “I grew up going to the first Asian Branch library in the ‘70s, when my mom took me when I was a toddler, and I have very fond memories of reading children’s books while my mom read novels in Chinese,” he said. Chan emphasizes that what makes the Asian branch library a “rare treasure” is its multi-Asian language collection. This is an important part of the story for the Oral History project, to represent Chinatown as an immigrant community hosting many different Asian cultures. 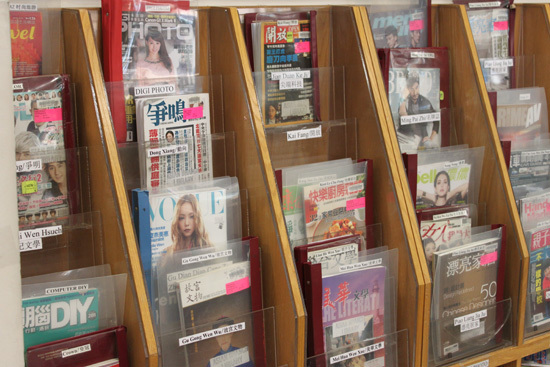 The periodicals section at the Oakland Asian Branch Library. The library’s multi-language collection makes it a hub for Asian language speakers in the East Bay. The Oral History project has started interviewing past branch staff, including Judy Young, founding manager, and Janet Chung, the current manager, along with others who have helped build the collection. For Chan, the Oral History project is an important step towards making Asian immigrant experiences in Oakland more visible. Transcripts of previous oral history projects can be found in hte library's stacks. Chan points to the example of eminent domain the ‘60s and the displacement of Chinatown residents to make way for the Lake Merritt BART station. His dream is not for Chinatown to be preserved exactly as it is, but for it to remain a vibrant cultural center and a hub for recent immigrants.